Walk into a Monday jazz night at the Red Lion in Isleworth, and from the relaxed, established feel of the evening you would assume the event had been running for decades, its more established fans still debating the new-fangled rhythms of bop. The rapport between performers and audience was so warm that I felt the glow from the back of a quietly appreciative crowd, formed mainly of dedicated music fans, while curious locals earwigged from the bar. Here, surely, was a regular gig that has nurtured its audience for decades. In fact it’s scarcely three years since Trevor Tomkins brought the session down the road from the Coach and Horses in nearby Brentford. Such is the following, you’d have had to get here well before the opening salvo of banter (a notable feature of the evening) from saxophonist Derek Nash in order to get a seat. It’s necessary, if a little impolite, to point out that the members of this quintet have, between them, several centuries of accumulated performing experience, and have played with a gallery-full of the biggest names in jazz. Nash and John Etheridge have dipped more than a toe into adjacent generic waters: Nash plays with Jools Holland’s Rhythm and Blues Orchestra, and Etheridge has performed widely in fusion bands, most famously Soft Machine. Experience gave them the confidence to relax. The playing was exceptionally skilful, but unpretentiously so: they knew each other too well to need to make much of a show of their free-wheeling interaction. House style was pacy, virtuosic and straight ahead, with driving rhythms and ecstatic harmonies. The repertoire had a funky, bluesy flavour, taking in, among others, Otis Redding and Horace Silver, though genres were mixed - like a good cocktail - with style, to create a deliciously intoxicating experience. Nash, Etheridge, Ted Beament and Trevor Tomkins all gave highly impressive solos, technically flawless, and with an infectious and overwhelming sense of sheer enjoyment. Tim Wells - drafted in at the last minute to replace an unwell Val Mannix - largely danced in the shadows, before leaping into the limelight with a virtuosic solo in the last number. Etheridge switched effortlessly between electric and acoustic guitars, while Nash used baritone, tenor, alto and soprano saxes, including an unusual curly soprano (his 1926 Buescher Tru Tone) with a delightfully cute, piping tone, more lyrical than the regular straight instrument. With an introduction to each number both informative and witty, the atmosphere hugely enjoyable. They were fun to watch, too, with a sense of madcap melodrama enhanced by the Red Lion’s small stage (converted from a darts booth, apparently). Etheridge has a great repertoire of expressive faces, while Nash plays the role of old-style showman-jazzer, his shop-window of beautiful saxes lined up before him. Perched by Nash’s foot for the first half was an orange, which I assumed to be a football-style interval snack. It turned out to be a shaker, used for off-the-cuff additions to Tomkins’ superb rhythm-work. The Red Lion’s drama group also uses the stage, and left-over pantomime props added to the atmosphere of subversive glee. A plaster pig peered over Ted Beament’s shoulder all evening, while a figure of Charlie Chaplin gazed studiously at bassist Tim Wells. The stage is ideal for a quartet or quintet, projecting the sound directly into the seated lounge area, and also sideways, through a viewing panel, into the bar, which filled with fortunate locals (do they realise how lucky they are?) during the evening. Tomkins’ programme varies week by week, and spans a musical range from fifties’ bop to contemporary. With excellent contacts among both stellar established musicians like these, and - as a teacher at Guildhall - emerging young talent (trumpeter Henry Armburg-Jennings headlines next week), the Red Lion offers an exceptional range of instrumental jazz, performed with both musical seriousness and a love of a show. 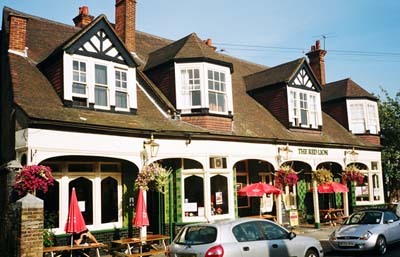 The support of the Red Lion’s management enables Tomkins to book serious talent months ahead, as you have to with performers of this quality. For a quiet suburban location, it was fantastic business for a Monday evening. One can only hope that the extra custom makes it worth their while to offer such exceptional music for free. This pub model of jazz performance has a great tradition in Britain, and is still where many jazz-lovers outside the large cities hear their music. The quality and variety of the line-up would make this an exceptional gig anywhere in London. The fact it’s free, and in such an appealingly laid-back venue, (with an excellent refreshment offer too - the Red Lion has been serially voted CAMRA pub of the year) makes this a must-visit venue for anyone in London or Middlesex. The Red Lion’s Monday jazz night is surely one of the London scene’s unmissable occasions. Great Night. Nice write up. I took some photos: http://www.flickr.com/photos/kmlivemusic/sets/72157634170846083/.